What car do you hope to purchase when it depreciates in value? As a general rule, new cars are expensive, especially the performance models that car lovers lust after. Even if you can't afford to purchase the car you lust after when it's brand new, as long as it's not something super rare or exotic, chances are eventually you might get a chance at owning your dream car for a reasonable price. This weekend we want to know what newer vehicle will be on your must buy list when it gets a little older and a little cheaper. Tell us what realistic price will it have to be to end up in your garage and approximately when you think that will be? What car do you hope to purchase when it depreciates in value? 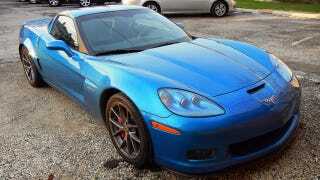 I'm waiting for the 2006 Corvette Z06 to depreciate in value so I have a chance at actually owning one. Why the 2006? Well it was the very first year for the 505 horsepower LS7 equipped C6 Corvette, which means it's the closest to getting cheaper. Hopefully given another 8 or 9 years I'll be able to purchase a clean Z06 somewhere in the mid to low 20 thousand range. This may be slightly wishful thinking, but I'm willing to suspend reality a little bit to entertain the day dream of a high horsepower Z06 sitting in the garage.